Hello! I do hope you're all well this sunny Saturday. A massive and heartfelt ♥THANK YOU♥ for your comments in response to my last post. I was completely touched by your kindness. In fact, a few of you brought tears to my eyes. I'm not normally one to lick my wounds in public and came extremely close to deleting the post straight after I'd written it, but your supportive comments started to appear which filled me with confidence. To update you very briefly, we've been to look around the children's new schools and they are both fabulous. So colourful and creative. The blondies are thoroughly excited. You're absolutely right, I think I had underestimated how resilient children can be. As for the other business, well let's just say I'm stealing myself not to dwell on it. Do you like my little tree? Guess what it is. 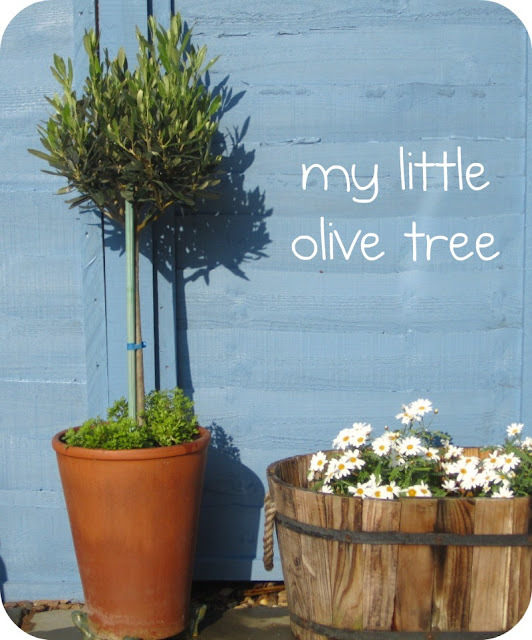 It's an olive tree! Blondie daughter and I adore olives and the idea of being able to pick and eat them straight from our very own tree fills me will such pleasure. Whether or not it will flower and fruit this year, I've no idea. Apparently they are extremely slow growing. I shall have to do a little research to find out more. I pottered around the garden first thing this morning in my dressing gown with my camera. It really is one of my favourite times of the year in our garden. The viburnum flowers are all nearly open and the smell is heavenly. 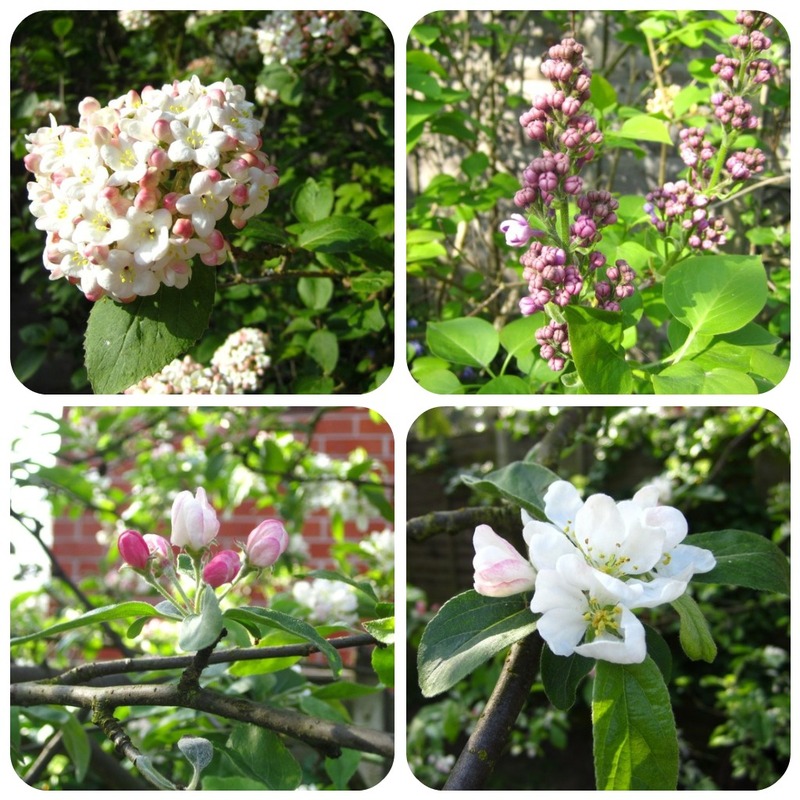 The lilac buds are bulging in readiness and the crab apple tree is peppered with pink and white. 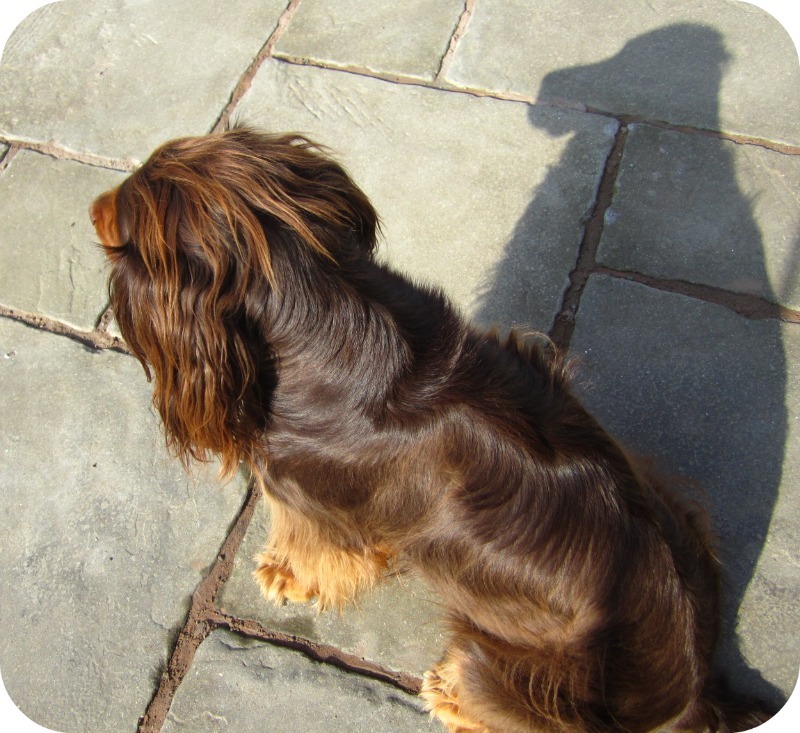 I couldn't resist showing you this picture I took of Bertie too - just love his shadow!!! 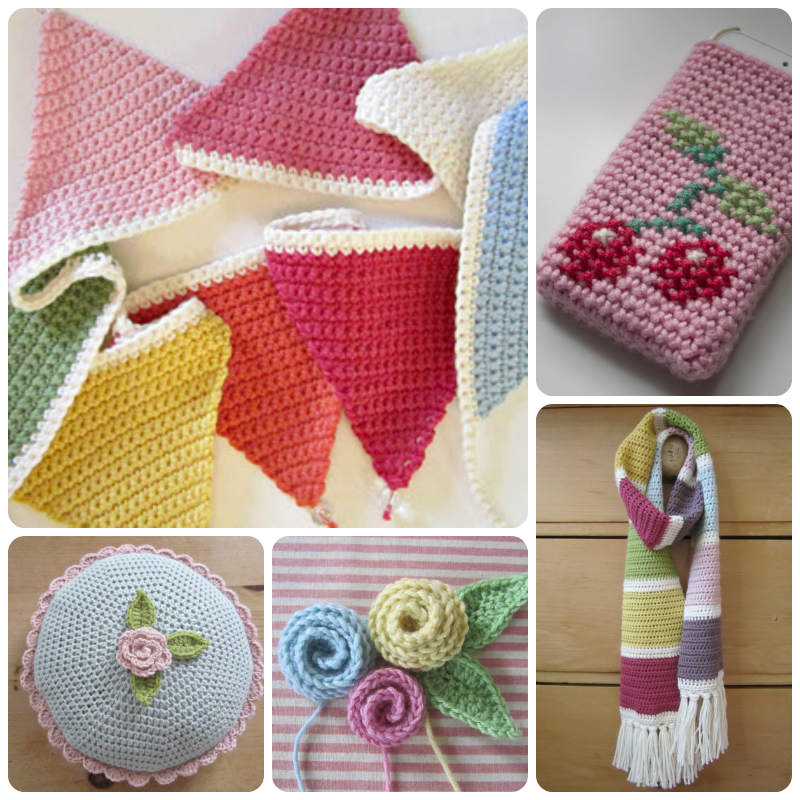 I really rather fancy making half a dozen in zesty colours to hang from my little Easter tree so I'd best 'crack on' (tee hee!). Enjoy your weekend and thank you again, you are all angels. I love this time of year too, we are novice gardeners having only caught the bug last year (until which our garden had been a bit of a wasteland!!) and we're getting such pleasure from watching things grow - who knew?!! Your blossoms are beautiful, I must see if I can squeeze a lilac in somewhere and Bertie has a super shiny coat!! Will check out the egg tutorial, and I love your CK eggcup!! Such lovely pictures! 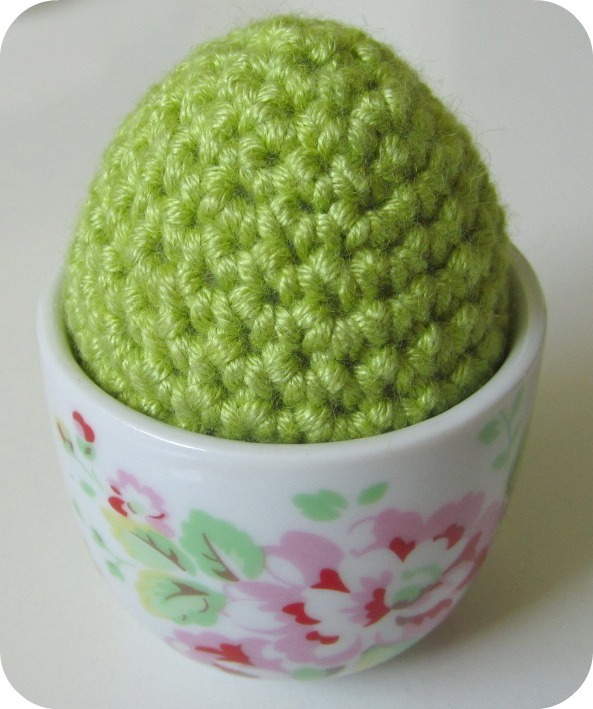 I love your olive tree, and the blossom pictures are beautiful..and the little green crochet egg is so cute. It's great to hear your children are happy and excited with their new schools, I'm so pleased. Hope you are having a wonderful weekend. Ooh your olive tree looks wonderful against that gorgeous bright blue wall! One thing about olive trees (which I learnt when I had one in the optimistic hope that it would crop but which sadly succumbed to those nasty minus 10 winter days we had in December) - you have to soak your crop of olives in brine before you eat them, they are utterley inedible and horribly bitter straight from the tree! (apparently). Love your crocheted egg too, gorgeous! But it is a beautiful tree all the same. Good to hear that your kids like their new schools, Im sure that they will settle in really quickly and be happy making new friends. We moved schools when my crew were in yrs 8, 6, 4 and 2. I fretted and worried - but they settled in without any problems at all, and like the fact that they have 2 sets of friends (they have kept in touch with friends from their olds schools up north even though it is now 7 years since we moved). PS thanks so much for your lovely comments on my blog!